star police – Lizzy Acker! 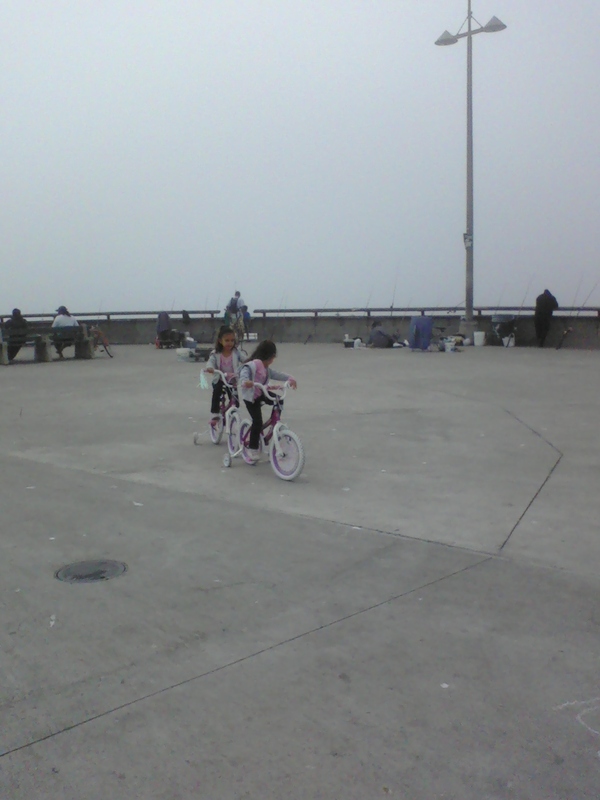 these are the creepy shining girls riding their matching bikes in silent circles on the end of the pier. this is two tough guys, pete and neil, looking hella tough. 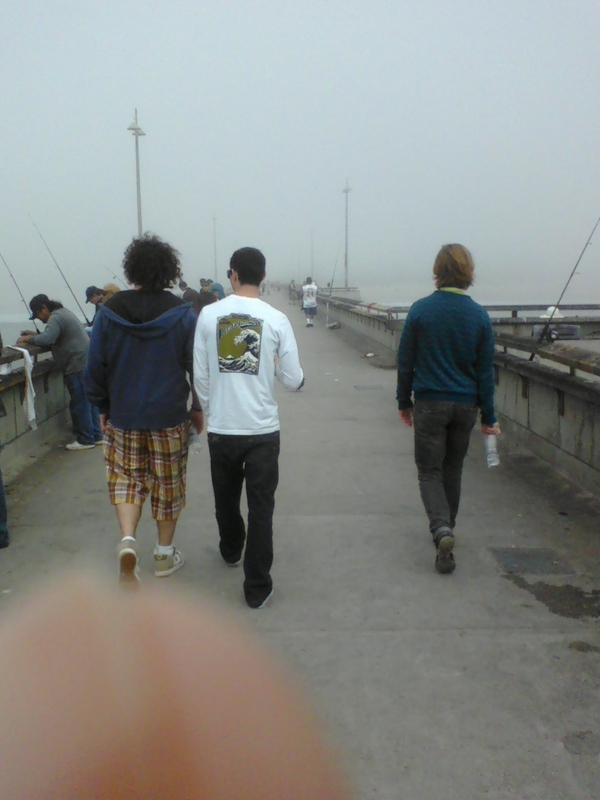 this is three tough guys walking into the fog on the pier. it is also my thumb. so. we went to la this weekend and stayed on this dude neil’s couch. neil is very cool. la is very cool. however, i got a very tiny amount of sleep and do not quite feel human yet. i did see four famous-type people, even though everyone kept making fun of me and saying i didn’t until i identified jason jones and samantha bee outside of a frozen yogurt place in venice and they all saw them too so i was vindicated. i think with the other people, it is just that i have a mild to serious tv obsession in part due to my lack of tv growing up, that makes me remember the faces i see so i can recognize the less famous. 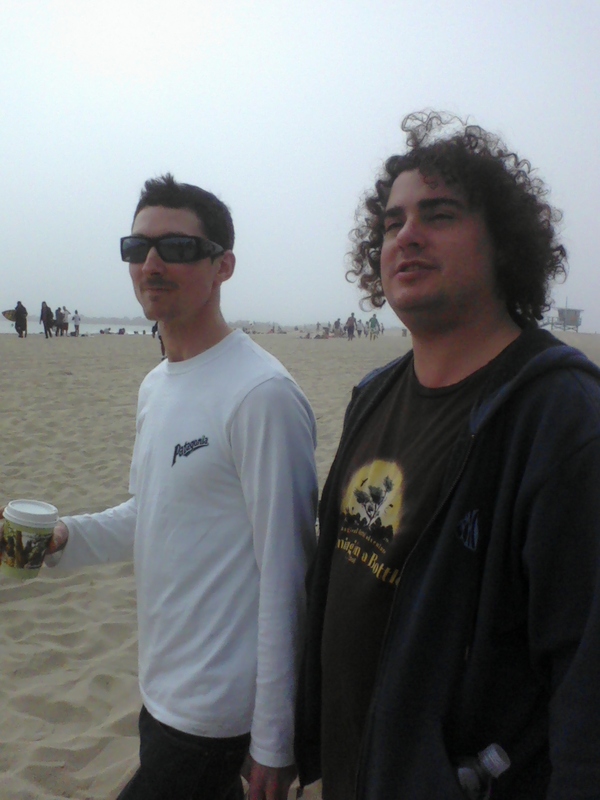 so i am pretty sure i saw this guy and this guy and i probably recognized them from lost and six feet under. i bet if you lived in la celebrities would get super old but what is weird to me is the idea of seeing someone you recognize and then the realization that you only recognize them because you have seen them over and over again on tv. usually when i recognize someone i run out out in the road and stop their car and hug them, even before i remember who they are or how i know them. this method has been used to run into people i last saw when i was five. anyway, it was a fun but tiring weekend. one nice thing was the serious hanging out with friends. pete was on the tail end of spring break and also we were not at home so we had nothing to do but hang out with the dudes. his friend dudes from home are a lot like my friend dudes from home and being adults with jobs and bedtimes, we don’t get that intense hangout thing very much anymore. especially not together. it made me think i would like to have all my friends in one place for a whole week, with a beach and nothing to do but hang out and build fires and talk to each other. oh man. my brain is dead. i am not used to the la lifestyle. the korean bbq. the valet parking. it is nice to be home.